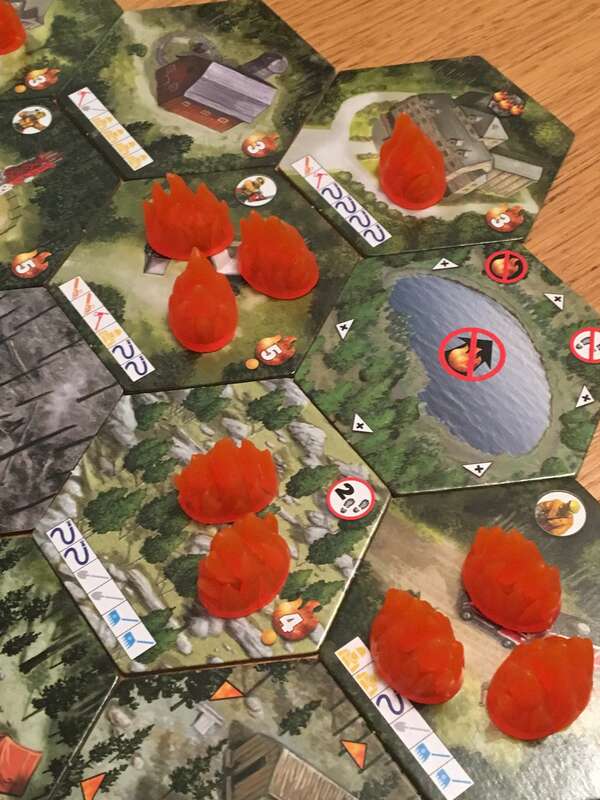 In Hotshots, from Fireside Games, between one and four players each take on the role of a specific firefighter in an attempt to stop the spread of uncontrolled wildfires in the mountainous forests of North America. Using randomised boards and push-your-luck mechanics, Hotshots plays like a super tough and more exciting version of Pandemic, but the question is, can you stand the heat? Firstly, I should comment on how unassuming Hotshots is, because the small box size and cardboard standee characters might cause some people to think that it is a low quality game, but that couldn’t be further from the truth. Actually, I feel the opposite way, because whilst Hotshots is just a bit too big to be considered portable, it will fit in an overnight bag and better still, it is amazing both solo and with friends. As a case in point, I have played Hotshots perhaps twenty times during the process of writing this review, but perhaps the most memorable was when I setup a solo game in Zurich airport and was approached by an interested party (who I had never met before) who wanted to ask me about the game. It was super easy to pass control of two of my four firefighters to him and before I knew it, we had a really good cooperative game on our hands. On that note, Hotshots is one hundred percent cooperative and features a completely ruthless, card driven enemy. 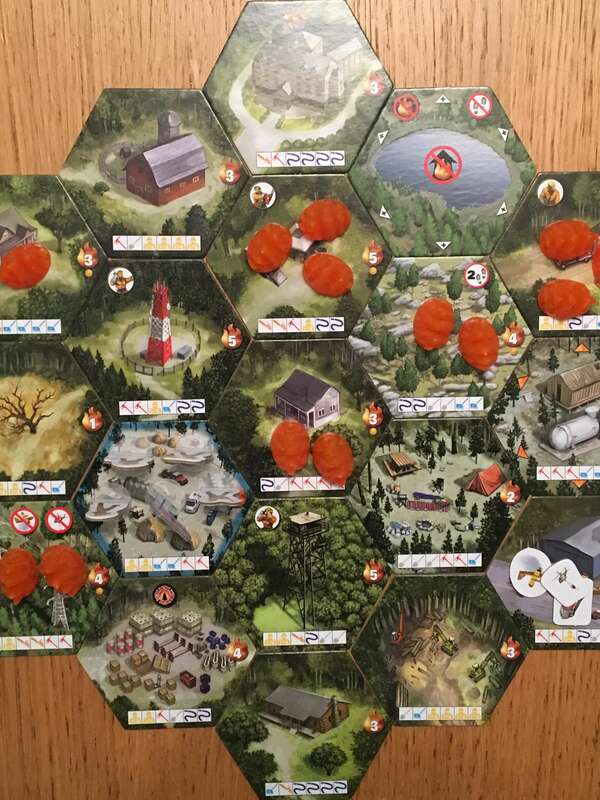 After the board is laid out (which is achieved by simply placing the hexagonal pieces on the board one by one in any order, using any of the patterns shown in the manual (or one of your own creation) the wildfire will start. From then on, a card will be drawn each turn that will usually cause it to spread and or intensify. Where Pandemic feels reasonably fair when it comes to the spread of viruses, Hotshots is absolutely brutal. Each section of the board has a numerical scorch value and when the number of cute little fire tokens on it reaches that number, it will scorch. At this point the players flip it to its scorched side and any benefits it offered are lost. Worse still, if enough sections of the board scorch, the players lose the game. Fighting the fire is challenging, but the push-your-luck mechanic that is used feels very thematic, especially when your firefighter is on a space that is at risk of scorching. 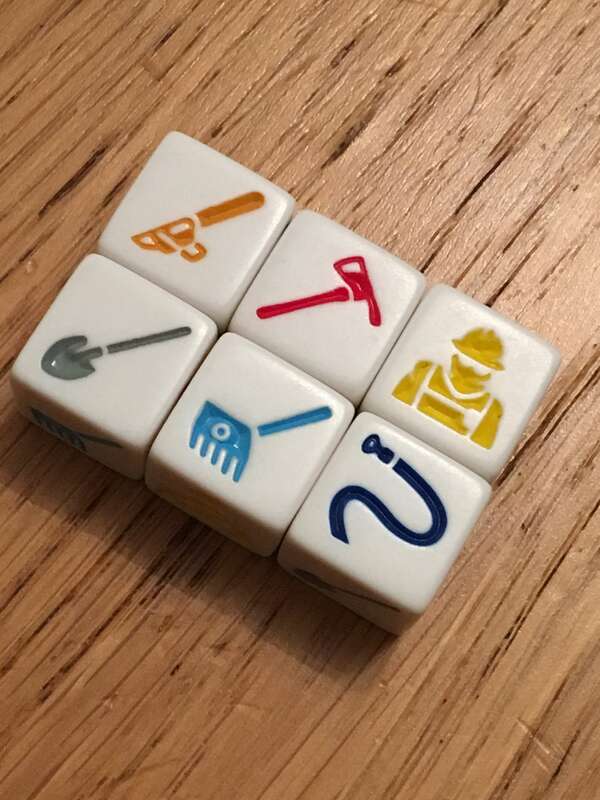 To remove fire tokens, the active player must roll six dice and attempt to match the faces shown on the current section of the board. Any faces that don’t match can be rerolled, but if any of these rolls results in zero matches, then a failure occurs, which results in the fire intensifying (and cancels the benefit of any matching die that have been rolled so far.) There are benefits for rolling anything between three and six matches, but players will really want five or six in order to remove two or three fire token respectively. At three, a fire barrier can be placed which will slow the spread, whilst at four a single fire is removed – and that’s almost never enough. Aside from the actual spread of the flames, another reason to draw a parallel with Pandemic is in the specific abilities of the firefighters. The Crew Boss, for example, can move another firefighter once per turn. The Swamper and the Sawyer can each swap rolled dice for different, specific faces. 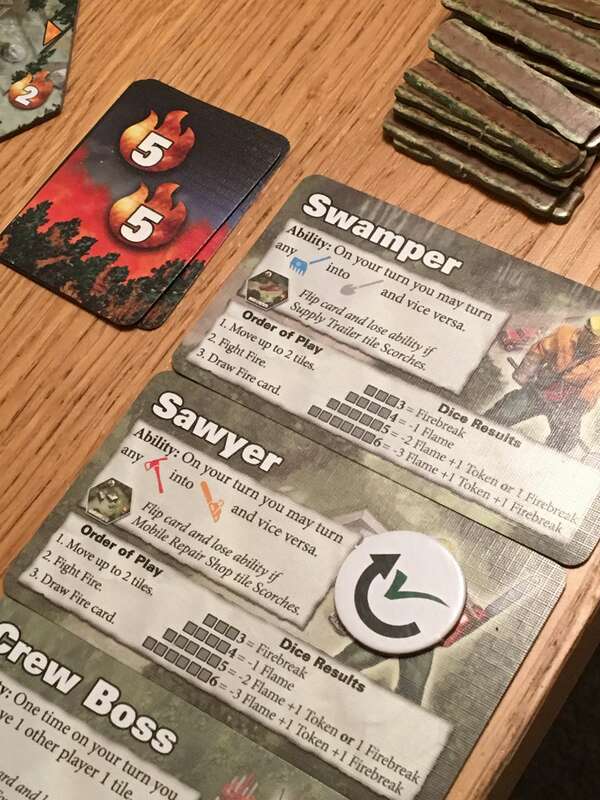 The last firefighter, the Spotter, draws two fire cards and plays one, placing the other on the top of the deck. These abilities are all invaluable and must be used at peak efficiency if the player(s) expect to have any chance of success. You see, Hotshots is more than just hard – it is brutally challenging and often, it is actually unfair – but I rarely felt it. I think that’s partly because it plays very rapidly and can be tore down and reset with ease, meaning that failures rarely sting for long. Between poor starting positions, unlucky rolls and series’ of bad cards, there is also a lot of luck involved, but again because of the push your luck element involved in the actual firefighting, you’ll often blame yourself for making a bad decision rather than the dice, which for me at least allowed me to think positively about the game even when I might have otherwise been able to see through some of the flaws in having several compounded luck based mechanics. 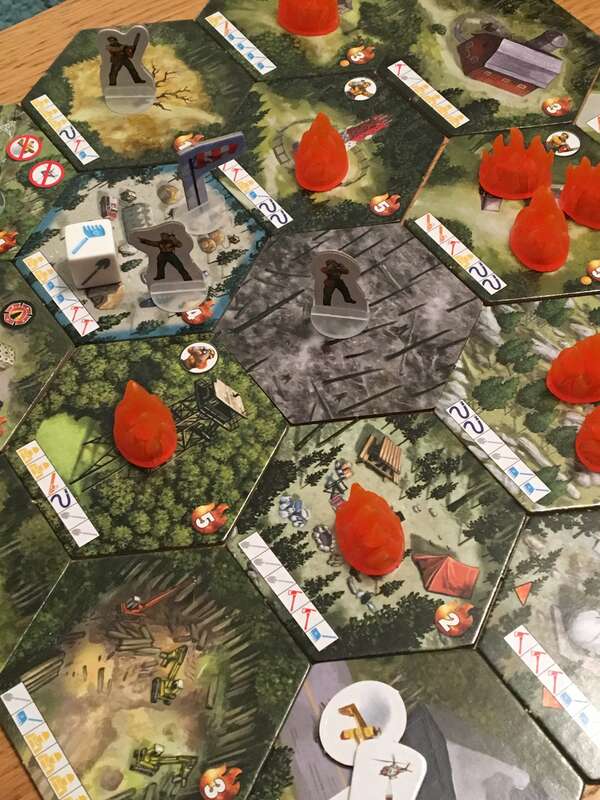 Ultimately, I liked Hotshots most of all as a solo experience or when played with another equally interested and experienced player, but also as a cooperative game that teaches something – the risks taken by these hotshot firefighters – this game is a success. It may come in a small package, but it has a lot of heart and it has a way of telling really fantastic stories. Hotshots is a fantastic effort from the appropriately named Fireside Games, and I’ll be playing it for some time to come. If you’re interested in finding out more about Hotshots, including stockists, then you can do so on the website of developer Fireside games.